A royal priesthood: That’s what that comes to mind with this the second of our new “Refined” WordPress church themes. 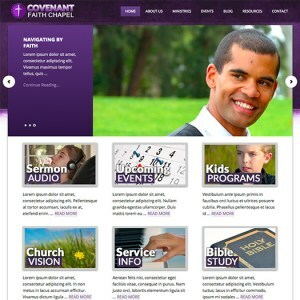 This is a premium Genesis framework WordPress theme for your church congregation that offers bold color choices to help your website stand out online. Rich, textured graphics help this design scheme to catch the visitor’s eye. And with just the right of movement happening on the homepage, this WordPress church site keeps the eye moving. Just as importantly, this new theme is as easy to install, setup and use, as it is striking in design appeal. And as with each of the premium Genesis themes offered here at CMSTF, your download comes with all of the photos and images you see in the live demo, as well as the full live demo install file. That allows you to get your church site up quickly and easily. Have any questions? Just drop us a line and we’ll be glad to help!